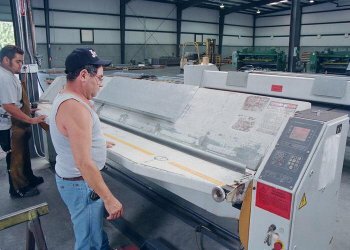 David Jacks (hired 1995) shears 26-gauge strips on our first machine, as the neighboring second shear is loaded for its next job. 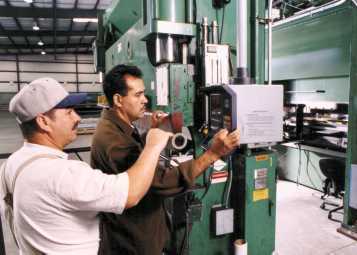 LEFT TO RIGHT: Antonio Morales (hired May, 2000) & Ramiro Ramirez (1989) operate our 20-foot-long CNC Accurpress, as Raphael Brambila (1996) loads a forklift and prepares to bring previously sheared pieces to be formed in this brake. 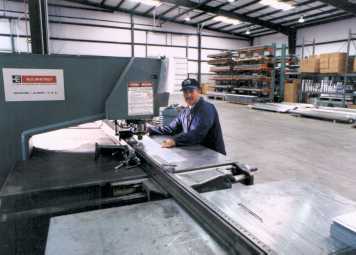 We're proud to show off our ability to bend metal pieces up to 20-foot lengths. LEFT TO RIGHT: Rafael Brambila, Aldo Lopez, Ramiro Ramirez, Antonio Morales, Jesus Guzman, Martin Brambila, Angel Cruz, Randy Grant, Martin Montero, Adrian Huerta, & Joel Cruz. 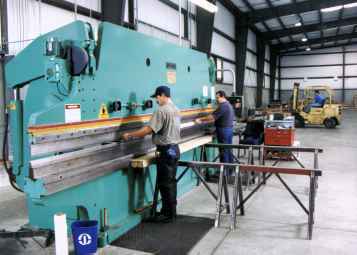 FROM LEFT TO RIGHT: Martin Brambila (1985) & Martin Montero (1997) program the CNC controls of one of our 12-foot brakes, the second machine visible to the right. 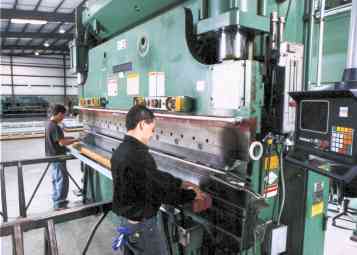 Left to Right: Adrian Huerta (1997) & Angel Cruz (1999) at the press-brake, executing the previously entered program. 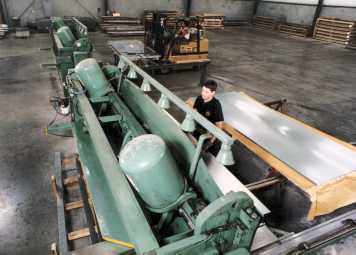 Left to right: Joel Cruz (1983) & Raphael Brambila manufacture many of our standard 10-foot residential roof flashings. Note the excellent repeatability of the completed stacks & our vast warehousing of similar products in the background. Right to Left: Oneto's father and son team of Jesus Guzman (1980) & Jose Guzman (1997) form precision pieces in one CNC RAS. Our second CNC RAS is visible to the right. 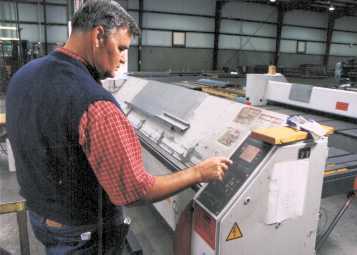 Raymond programs the CNC panel of one RAS folder before executing a job. 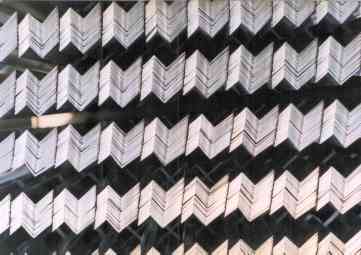 Jose Anselmo Huerta (1981) demonstrates the precision punching capabilities of the W.A. Whitney. Green Line: 7 stands, 1 3/8" arbors, 7200 ft/min, 2 sizes of z-bar. 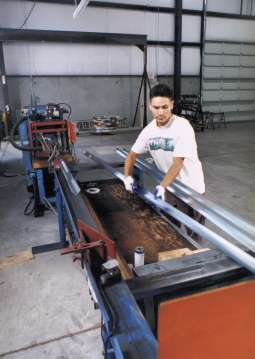 Rudolfo Cruz (1994) manufactures shingle nosing on our blue roll-forming line. 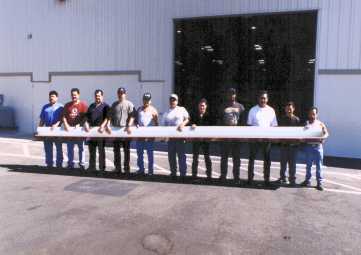 Oneto Metal Products Corp. proudly shows a typical bundle of roll-formed product. 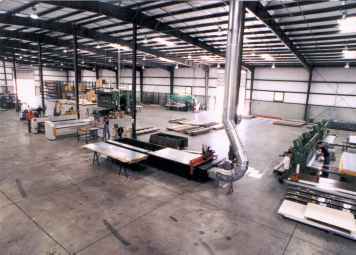 Observe the neat nesting of these products; we manufacture roll-formed products of the highest quality at reasonable prices.